Genealogy Roundtable, at the Derry Public Library, 64 East Broadway, Derry, NH http://www.derry.lib.nh.us/ every first Tuesday of the Month, at 7pm to 8:15pm in the downstairs meeting room. Contact: Alan Howard at 603-432-6140 for more information. South Shore Genealogical Society, at the John Curtis Free Library, Rt. 139, Hanover, Mass at 1:30pm ever second Saturday of the month from September to June. Monthly Irish Study Genealogy Group, usually every 4th Saturday of the month at NEHGS, 99 – 101 Newbury Street, Boston, Massachusetts between 9:30 and noon in the Education Center (2nd floor). Contact Mary Ellen Grogan for more information megrogan@ix.netcom.com and to confirm the meeting time and date. February 1, Saturday, 10:30 – 11:30am Mobile Genealogy, Part II, Imaging on the Go, at the New England Historic Genealogical Society, 99 – 101 Newbury Street, Boston, Massachusetts. Genealogist Alice Kane presents how to use digital cameras and the Flip-Pal scanner for recording documents. Free and open to the public. To reserve your space email education@nehgs.or or call 617-266-1226. February 1, Saturday, 9:30 to 11am, Duxbury Senior Center Genealogy Club, genealogist Michael Brophy will present a discussion on how to access and use electronic databases, at the Duxbury Senior Center, 10 Mayflower St., Duxbury, Massachusetts. February 4, Tuesday, 7pm Beginning Again: Tackling a New Research Area, at the Chelmsford, Massachusetts Public Libary, by the Chelmsford Genealogy Club with presenter Christine Sharbrough, librarian and certified genealogist. February 4, Tuesday, 7:30pm, Winning the War, Shaping the Peace: Industry, Civil War, and the Birth of Consumerism, at the Exeter Historical Society, 47 Front Street, Exeter, New Hampshire. Contact Laura Martin Gowing 603-778-2335 for more information. Free to the public. February 6, Thursday, 12:15pm, Sarah Prince: A Life in Meditations and Letters, at the Old South Meeting House, 310 Washington Street, Boston, Massachusetts, part of the Midday at the Meeting House talks, free to members, $1 - $6 for others, presented by historian and Wheelock College professor Laurie Crumpacker. February 8, Saturday, 1:30pm, The Underground Railroad in New England, at the Derry Public Library, Derry, New Hampshire, presented by Eleanor Strang in honor of Black History month. Contact Sherry Bailey at 603-432-6140 for more information. Free to the public. February 10, Monday, 6:30pm, Local History Series: The Day that Made Robert Frost, at the Derry Public Library, Derry, New Hampshire, presented by the Derry Town Historian Rick Holmes. Contact Sherry Bailey at 603-432-6140 for more information. Free to the public. February 12, Wednesday, 6:30pm Mary Todd Lincoln: An Unconventional Woman, at the Kimball Public Library, 5 Academy Avenue, Atkinson, New Hampshire. Watch Sally Mummey interpret Mary Lincoln during the Civil War years. Contact the library 603-326-5234 for more information. Free to the public. February 13, Thursday, 12:15pm, Abigail Adams: Life, Love and Letters, at the Old South Meeting House, 310 Washington Street, Boston, Massachusetts, part of the Midday at the Meeting House talks, free to members $1 - $6 for others, presented by living history interpretoer Patricia Bridgman using Abigail's correspondence with her husband, John Adams. February 18, Tuesday, 7:00pm Civilians of Gettysbury, 1863, at the Merrimack Public Library, 470 Daniel Webster Hwy, Merrimack, New Hampshire. Contact Anita Creager at 603-424-5084 for more information. Free to the public. February 20, Thursday, 12:15pm, Petticoats at the Revolution, at the Old South Meeting House, 310 Washington Street, Boston, Massachusetts, part of the Midday at the Meeting House talks, free to members, $1 - $6 for others, presented by Joan Gatturna who portrays Rachel Revere. February 26, Wednesday, 6pm Boston’s Changing Neighborhoods at the Boston Public Library, Commonwealth Salon, presented by Evan Thornberry, the cartographic reference librarian for the Norman B. Leventhal Map Center at the Boston Public Library and by Jonathan Wyss. Free to the public. February 27, Thursday, 12:15pm, "Lett No Country Grants to be Laid Upon our Lands" at the Old South Meeting House, 310 Washington Street, Boston, Massachusetts, part of the Midday at the Meeting House talks, free to members, $1 - $6 for others, an illustrated lecture by anthropologist and UMass Boston professor Amy Den Ouden who explores what we can learn about indigenous women's daily lives from 18th century land petitions. April 1, Thursday, Researcher Forum, at the National Archives facility in Waltham, Massachusetts, 380 Trapelo Road, Free to the public. Researching original records has changed in recent years, no longer are you winding the microfilm, and the resources and strategies have expanded. Learn about the new and exciting initiatives for researchers, and use this open forum opportunity to tell the National Archives how researching can be made better for you. April 5, Saturday, Maine Genealogical Society Spring Workshop, at the Elks Club, 397 Civic Center Drive, Augusta, Maine, Featuring Maureen Taylor, the Photo Detective, co-hosted by the Maine Historical Society. May 31, Saturday, 9am to 4pm. Southern Maine Genealogy Conference, to be held at Keeley’s Banquet Center, 178 Warren Avenue, Portland, Maine, the keynote speaker will be Joe Anderson. Danvers, MA — Muriel (Herrick) Karolides, Pastor Emeritus of The First Spiritualist Church of Salem, passed peacefully to the spirit side of life on January 24, 2014. Born in Salem on September 27, 1913, she was the daughter of the late Moses S. and Maybelle (Hitchings) Herrick. She was the wife of the late John Karolides. She was a homemaker and briefly worked at Leader Baby Shoe and Hotwatt. Mrs. Karolides dedicated 70 years serving her church as Secretary, Vice President and President. A Certified Medium and Licentiate Minister, she was Assistant Pastor and then Pastor until her retirement in 2004. She served as Secretary of the Massachusetts State Association of Spiritualists for 20 years. In 2005, she was elected Pastor Emeritus and honored with a Life Time Achievement Award by the National Spiritualist Association of Churches. She was a member of the International Order of Eastern Star, Tontoquan Chapter, and formerly the Mt. Burnett Chapter 119. Pastimes included composing inspirational songs and poetry and caring for many feline friends. She leaves two daughters, Elizabeth (Sue) Gehling and Priscilla M. Herrick of Danvers, and her daughter-in-law, Nancy Karolides of Florida. 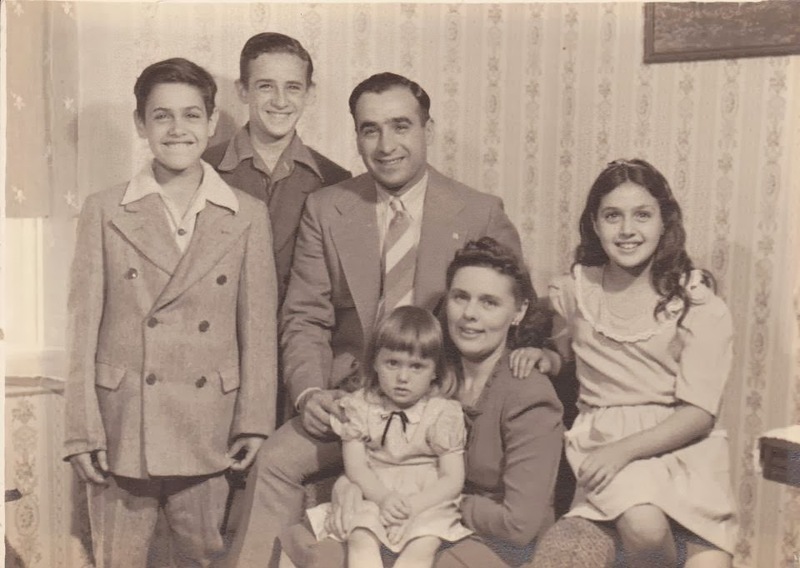 In addition to her children, she leaves 16 grandchildren, William Karolides, Debbie Karolides, Tracey McNichol, Robert Karolides, Candy McGann, Dawn Karolides, Jay Karolides, Tyra Karolides, Robyn Picillo, Matthew Karolides, Mark Karolides, Heidi Gehling Adams, Timothy Gehling, Shawn Gehling, Elisabeth Lemp Cheney and Rebecca Lemp Matthias; 25 great-grandchildren and 10 great-great-grandchildren. Along with her many nieces and nephews, she also loving remembers foster nephew, David LeClair and his wife, Debbie, of Danvers; niece, Barbara Mahoney of Beverly, and former son-in-law, Herman Lemp. She was predeceased by sons, Joseph, James and William; her brothers, Charles and Frank; and her sisters, Hilda Patterson and Eleanor Trask. ARRANGEMENTS: A Memorial Service will be held at the First Spiritualist Church of Salem, 34 Warren St., Salem, MA, on Saturday, February 1, 2014, at 11 a.m. All are invited. In lieu of flowers, donations can be made to The First Spiritualist Church, 34 Warren St., Salem, MA 01970 or to PALS Animal Life Savers, c/o Kristina Wheeler, PALS Treasurer, 10 Turner Street, Salem, MA 01970. Muriel Herrick was almost 101 years old when she passed away. She was my grandmother's first cousin, and is the last known person in her generation. My grandmother Gertrude (Hitchings) Allen died in 2001, at the age of 95. The Hitchings side of the family had some members who lived until their 80s and 90s even in the 1600s, which is quite an achievement! Our immigrant ancestor Daniel Hitchings was born about 1632 in England and died 14 April 1731 in Lynn, Massachusetts. He deposed on 11 April 1722 that he was 90 years old. I'm Going to Jamboree! So You'll be able to Read All About it Here in June! 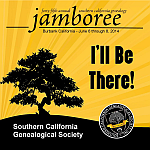 The Southern California Genealogical Society holds an annual conference known as "Jamboree". I attended the Jamboree in 2011, and it is still my favorite of all the genealogy conferences I have attended. The 2014 Jamboree will be held in Burbank, California June 6 - 8, 2014 at the Airport Marriott hotel. Every Wednesday for more than two years Vincent and I have been posting photographs of weather vanes located in or near the Nutfield area (the former name for the land where Londonderry, Derry and Windham, New Hampshire are now located). Most are historically interesting or just whimsical and fun weather vanes. If you know an interesting weather vane, please send me an email or leave a comment below. Today's weather vane was found just over the border in Vermont. Have fun guessing where you may have seen this weather vane. Today's weather vane was seen over the Quechee Diner in Quechee Gorge, Vermont. We stopped to eat lunch here, and only noticed the weather vane as we were walking toward it. It is a large, gilded, three dimensional eagle. There is an actual dining car here, attached to a large building with additional seating and a gift shop. Of course, we ate in the booth in the old, antique dining car! Breakfast (my favorite) is served all day. The Diner is located in a shopping area with five great weather vanes! This tombstone was photographed at the Point of Graves Burial Ground, Portsmouth, New Hampshire. In the book Historic Burial Grounds of the New Hampshire Seacoast by Glenn A. Knoblock, "William Mumford, a Quaker of Boston, carved this double gravestone. The women were sisters, the daughters of Major Charles Frost. Sarah married William Redford, a distinguished man who served as provincial secretary. Major Frost was equally distinguished. He served as a sergeantmajor for all of Maine from 1682 to 1688, and as a judge of the Common Pleas Court. He died on July 4, 1697, as a result of an "Indian" ambush on his way home from meeting." Major Charles Frost was born 30 July 1631 in Tiverton, Devonshire, England and died on 4 July 1697 in Berwick, Maine (just across the river from the Point of Graves). He married Mary Bowles, daughter of Joseph Bolles and Mary Howell. Mary's great grandparents are Henry Perkins and Elizabeth Sawbridge, my 11th great grandparents. He sculpted the Concord Minuteman, and the Lincoln Memorial Statue. In the 1930s his study was moved to the museum, since the house suffered several fires. interesting exhibits from all time periods in Concord history. Although some earlier works stated that Samuel Allen was a son of George Allen, there is no proof of this. In The Great Migration, Volume 1, page 34 the author, Robert Charles Anderson, rejects the notion, too, in his sketch for George Allen. The sketch for Samuel Allen is on pages 39 to 40. Witnesses, Francis Elliott, John French, Thomas Holbrook. This instrument was acKnowledged by Margaret Allen & Joseph Allen as theire Act & deede. Novemb'r 16th 1672 before Edward Ting Assist. Recorded & Compared Nov'r 21st 1672 p: Isaac Addington Cler. Generation 1: Samuel Allen, born about 1598 In England and died 5 August 1669 in Braintree (now Quincy), Massachusetts; married first about 1630 in England to Ann Whitmore (four children), married second to Margaret French, the widow of Edward Lamb (three children). Generation 2: James Allen, born about 1636 in Braintree (now Quincy) and died 25 July 1714 in Tisbury, Massachusetts on the island of Martha’s Vineyard; married about 1662 in Duxbury, Massachusetts to Elizabeth Partridge, daughter of George Partridge and Sarah Tracy. She was born 14 February 1643 in Duxbury, and died 8 August 1722 in Chilmark, Massachusetts on the island of Martha’s Vineyard. Twelve children. Generation 3: John Allen born 1682 in West Tisbury, and died 17 October 1767 in Chilmark; married on 1 March 1716 in Chilmark to Margaret Homes, daughter of William Homes and Katherine Craighead. She was born 28 February 1696 in Straban, Tyrone, Ireland and died 26 April 1778 in Chilmark. Thirteen children. Generation 4: Rebecca Allen, born 25 February 1717 in Chilmark, died 29 May 1790 in Pleasant River, Maine; married in 1732 in Chilmark to Wilmot Wass, son of John Wass and Ann Wilmot. He was born 9 February 1712 in Boston, and died before 18 July 1793 in Windsor, Connecticut. Twelve children. 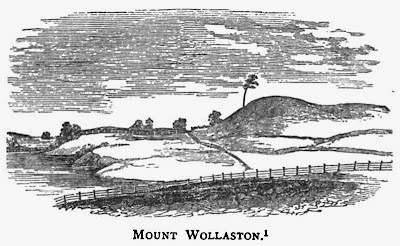 The image above is from Wikimedia Commons, "The New English Canaan of Thomas Morton", by Charles Francis Adams, Jr., Boston, 1883 "This view of Mount Wollaston is taken from Rev. William P. Lunt's Two Discourses on the Occasion of the Two Hundredth Anniversary of the First Congregational Church, Quincy", page 37. Over the weekend, on January 25th, is the night usually set aside to celebrate the Scots poet Robert Burns at dinners known as “Burns Night”. The whiskey and the poetry recitations flow at these occasions. Haggis is served, and pipes are played, and there are multitudes of wordy toasts. Here in New Hampshire the poems of Burns are sometimes mixed with the poems of Robert Dinsmore, Nutfield’s own Scots Irish poet. Robert Dinsmore (1757 – 1836) was born in Windham, New Hampshire, the son of Scots Irish immigrants. He was a simple farmer, and also known as “The Rustic Bard.” His poetry reflected not only the landscape of New Hampshire, it also was written in the Scots dialect similar to Robert Burns. The following poem was written when Dinsmore crushed a sparrow’s nest while plowing his field. Read it aloud and see if it doesn’t remind you of Burns, too. John Greenleaf Whittier wrote a book Old Portraits and Modern Sketches, and included this poem as one that most reminded him of the Scots poet Robert Burns. Why should my mould-board gie thee sorrow! "Alas! alas! my bonnie birdie! Thy faithful mate flits round to guard thee. It gars me greet to see thee pine. Their sweet wee bairns laid I' the mools? 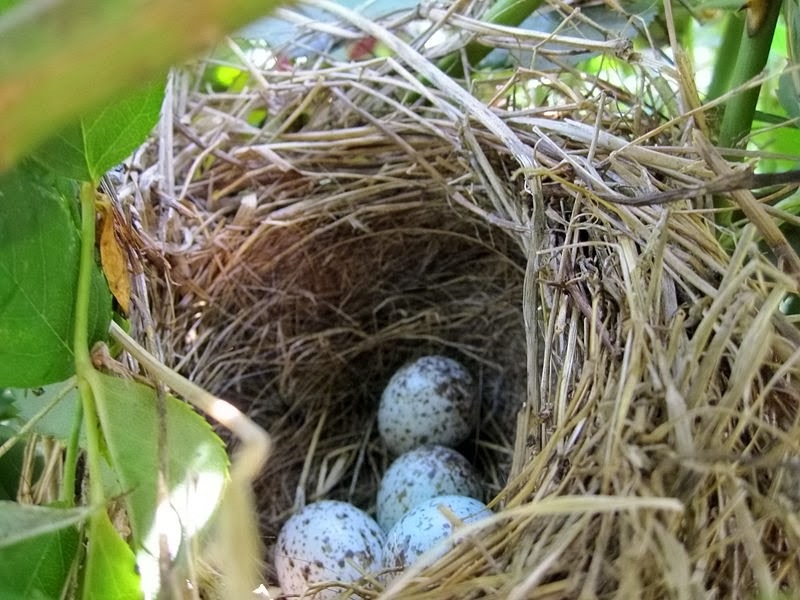 The Song Sparrow Nest photo is from Wikimedia, Tony Alter, from Newport News, VA, USA, 2010, licensed under Creative Commons. Heather Wilkinson Rojo, "A Burns Night poem by “The Rustic Bard” of Windham, New Hampshire", Nutfield Genealogy, posted January 24, 2014, ( http://nutfieldgenealogy.blogspot.com/2014/01/a-burns-night-poem-by-rustic-bard-of.html: accessed [access date]). Early Lexington, Massachusetts was known as Cambridge Farms, and also as Scotland because one of the early settlers was William Munroe. He was a Scots prisoner of war, sold into servitude on the docks of Charlestown in 1651. By 1657 he was free, and had removed to what is now Lexington. His grandsons fought in the Battle of Lexington in 1775, and several were killed. Two of my 5th great uncles, Robert Munroe (1712 - 1775) and Jonas Parker (1722 - 1775) (he was married to my 5th great grandfather's little sister, Lucy Munroe) were some of the Munroe kin killed on the 19th of April 1775. Jedediah Munroe (1721 - 1775), who was killed in the Battle, was a first cousin to my Munroe great uncles who died in the same battle. His grandsons went into the clock making business together in Concord, Massachusetts. One of the three brothers, William Munroe (1778 – 1861) was a cabinetmaker, and he built the cases for the clockworks. William was also a fine furniture maker. During the War of 1812 his furniture business dropped off, but he learned that people were paying a premium for pencils. Most pencils at that time were made in England, but during the war there was a shortage of them. So William went into the pencil making business which made him a rich man. He made the first wooden graphite lead pencils in the United States. Although he was famous for his pencil business, among collectors he is well known for his fine furniture. Any Munroe furniture that comes up at auction commands very high prices, and is highly sought after by antique dealers. His brief time as a cabinetmaker produced many wonderful pieces of furniture. Recently many of his side boards, chests and clock cases were gathered for an exhibit at the Concord Museum in Concord, Massachusetts. You can see this exhibit through 23 March 2014. They have some of his famous pencils on exhibit, too! of his ability as a cabinetmaker. At the Concord Free Public Library until January 31, 2014 is a special exhibit on the William Munroe family, too. Before going, check the website http://www.concordlibrary.org/ or call them at 978-381-3300 to check the hours of the exhibit. At this exhibit we saw lots of family photos and documents, a family tree, Munroe artifacts donated to the book and art collections at the Concord Free Public Library and more Munroe pencils on exhibit! Generation 1 : William Munroe, born about 1625 near Inverness, Scotland; died 27 January 1718 in Lexington, Massachusetts; married in 1672 to Mary Ball as his second wife (three wives), daughter of John Ball and Elizabeth Pierce. She was born 1651 and died August 1692 in Lexington. William Munroe and his first wife, Martha George, are my 7th great grandparents. Generation 2 : Daniel Munroe, born 12 August 1673 in Lexington, died 1 February 1733 in Lexington; married about 1716 to Dority Mooers, daughter of Jonathan Mooers and Constance Langthorne. She was born 6 November 1688 in Newbury, Massachusetts, and she was the sister of my 6th great grandmother, Sarah Mooers, the wife of George Munroe (actually three Mooers sisters married three Munroe brothers!). Generation 3: Jedediah Munroe, born 20 May 1721 in Lexington, died 19 April 1775 at the Battle of Lexington; married September 1744 in Lexington to Abigail Loring, daughter of Joseph Loring and Lydia Fiske. She was born before 7 January 1722 in Lexington, died 30 November 1711 in Lexington. Generation 4 : Daniel Munroe, born 23 September 1744 in Lexington, died 23 July 1827 in Roxbury, Massachusetts; married on 15 September 1774 in Roxbury to Abigail Parker. She was born 30 January 1753 in Roxbury and died 1 May 1744 in Barnstable, Massachusetts. Generation 5: William Munroe, born 15 December 1778 in Roxbury, Massachusetts; died 6 March 1861; married to Martha (Patty) Stone, daughter of Captain John Stone and Martha Greenough. Nine children, including William Munroe (1806 – 1877) founder of the Concord Free Public Library. Weathervane Wednesday ~ Three For One! Today's weather vane was just over the border in Vermont. It is actually three weather vanes on one building. Have fun guessing where you may have seen these weather vanes. Today's weather vanes were seen on top of the Quechee Gorge Village Marketplace antique shop. They are gilded, and quite large, so they were very visible from Route 4. The deer weather vane is especially large, but it tilted at a precarious angle. We stopped here after seeing the famous Gorge (less than half a mile down the street) and went into the antique store where I found a large selection of used books on New England history. There were five weather vanes in this one shopping area! A great stop for weather vane fans. The 2014 New Hampshire Mayflower Society Memorial Scholarships are available to any college student (undergraduate or graduate student) or high school senior. You don't need to be a member of the Mayflower Society, or a descendant of a Mayflower passenger to apply, but members and close relatives of members will receive preference (defined as members, junior members, siblings, children, grandchildren and great grandchildren). Applicants with no affiliation to the New Hampshire Mayflower Society are invited to apply. This is one of the few Mayflower scholarships in the USA awarded to non-members. Applicants MUST be able to attend the award ceremony, in person, in New Hampshire. It is expected that at least two to four scholarships of $500 to $1000 will be awarded in May 2014. Applications and instructions are available at the website www.nhmayflower.org and applications and all required paperwork is due strictly by February 15, 2014. Or you may email Heather Rojo at scholarship@nhmayflower.org for more information and further instructions. The New Hampshire Mayflower Society can also be found on Facebook. The requirement to attend the spring meeting may be waived at the discretion of the New Hampshire Mayflower Governor due to such issues as illness or death in the family. Should the recipient receive a waiver from the Governor due to a hardship, a letter from the recipient to the Society must be submitted to be read at the meeting, as well as a photograph of the recipient for display. In such cases, parents or relatives may attend the award ceremony to accept the award on the recipient's behalf. 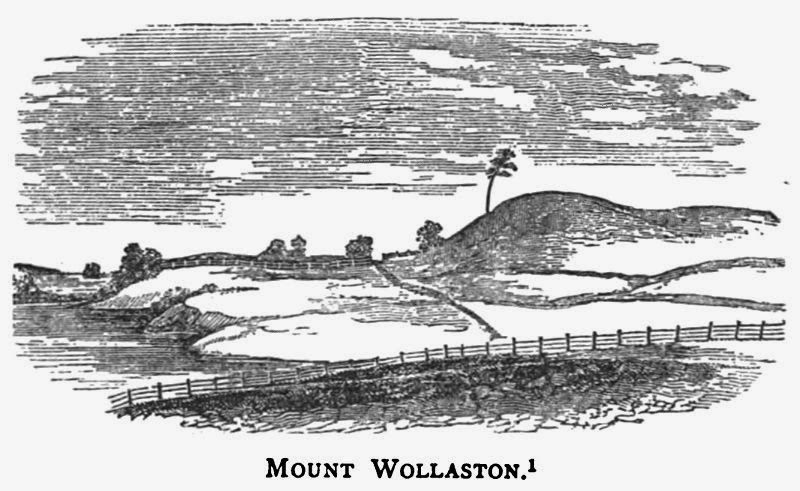 From the book Historic Burial Grounds of the New Hampshire Seacoast by Glenn A. Knoblock, "William Button, 1693, Point of Graves, Portsmouth. This elaborate stone was carved by a man known only as "J. N.", and has been restored in recent years. Button was an English merchant with a large business on the Piscataqua River. He met his death by drowing, probably after falling overboard from his ship Lyon. The inscription includes the names of the two men who buried him, Clement Lempriere, a sea captain of the Island of Jersey, and Thomas Button, William's brother. At his death, Button left an estate valued at 1490 pounds, a very large sum in those days. The details on this stone are striking. Note the funeral urn in the center topped with a small-winged skull, flanked by cherubs. The intricately carved side borders depict pomegranates and gourds amidst an abundance of leaves. Button's gravestone leaves no doubt to his wealth and standing in the community." 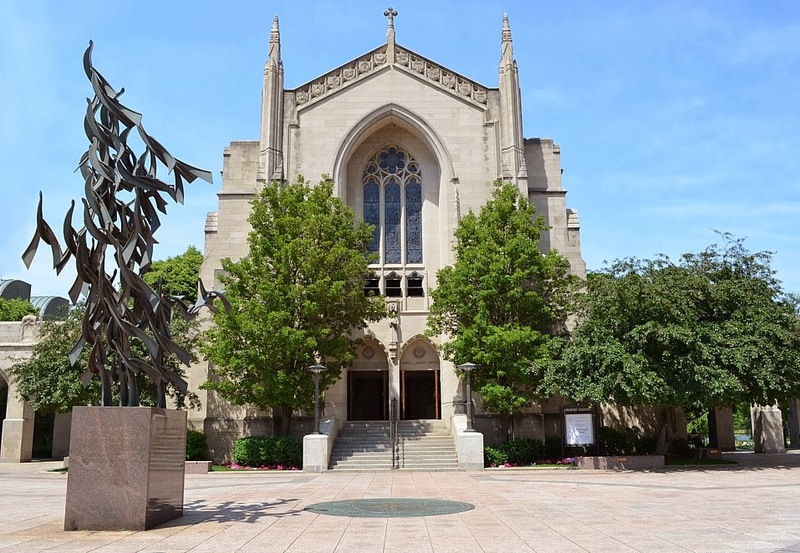 and the sculpture "Free at Last" dedicated to Dr. Martin Luther King, Jr.
Martin Luther King, Jr. came to Boston in 1951 to attend Boston University graduate school, earning a Ph. D. in theology in 1955. Howard Thurman’s sermon’s at the Marsh Chapel, including his accounts of visiting Gandi taught King about nonviolent protest. Dr. Thurman was the first black dean of a predominantly white American university. Today the BU library houses King’s personal papers. My Dad was at Boston University at the same time as Dr. King. He matriculated in 1952 and graduated in 1957. Dad took many classes in theology, but he was a Government major. I don’t know if he ever crossed paths with Dr. King, or if he would have even known him in those years before he was famous. But Dad always liked to mention the fact that they went to the same school at the same time. Dr. King loved Boston after choosing to study here because of the diversity in the community. It was in Boston that he met his wife, Coretta Scott, who was a student at the New England Conservatory. He returned to Boston in 1965 to address a joint session of the Massachusetts legislature, and on the following day he led a freedom march from the South End to the Boston Common where he spoke to 22,000 people in the rain. The night of the assassination of Dr. Martin Luther King, Jr. in 1968, there was violent unrest in the city. But the following night, although many US cities had continuing violence and riots, the rock star James Brown kept the peace in Boston. He had been scheduled to appear in the Boston Garden, but agreed with Mayor Kevin White to have his concert broadcast live on WGBH TV. It was hoped that this would keep Bostonians in front of their TVs at home instead of protesting on the streets- and it worked. Today, there are lasting signs of Dr. King’s legacy in Boston - Martin Luther King Boulevard in Roxbury, The MLK Towers housing project, the annual Martin Luther King, Jr. Breakfast, scholarships, schools, sculptures and community programs all bear his name and continue his memory. “The Night James Brown Saved Boston” http://www.youtube.com/watch?v=B1MXrl_9AlY and also http://www.youtube.com/watch?v=DsHZakDPDvo, etc. Heather Wilkinson Rojo, "Martin Luther King in Boston", Nutfield Genealogy, posted January 20, 2014, ( http://nutfieldgenealogy.blogspot.com/2014/01/martin-luther-king-in-boston.html: accessed [access date]). Edmond Hawes was baptized in Solihull, Warwickshire, England on 15 October 1613, the son of Edmond Hawes. He was apprenticed to a “cutler” (knifemaker) named Edward Warnet, and his records can be found in the London Company of Cutlers according to the Great Migration sketch of his life. Edmond Hawes was a passenger on the James, which left Southampton, England about 5 April 1625. His first residence in Massachusetts was the town of Duxbury. He was made a freeman in Duxbury on 3 March 1644/5, and then removed to the town of Yarmouth by 1643. He held many offices, which can be found in the Plymouth County Records, such as deputy, auditor, constable, selectman, and various committees. The Plymouth County Records also record many land transactions in Duxbury and Yarmouth, and his will dated 5 May 1692 and proved on 20 July 1683. The name of his wife is unknown, and he had only one child, John, born about 1636, who married Desire Gorham, the granddaughter of John Howland the Mayflower passenger. All of Edmond Hawes descendants are eligible for membership in the General Society of Mayflower Descendants. John Hawes died in 1701, after having his leg amputated . As a young man he had been brought before a jury on 5 March 1600/1 for accidentally causing an injury in a friend he had been wrestling. He was found “not guilty” and released. He grew up to also be a cutler, and served as a representative to the General Court. The best sources for information on Edmond Hawes are The Great Migration, by Richard Charles Anderson, Volume II, pages 247 - 250. Another good source of information is the book Edmond Hawes of Yarmouth, Massachusetts, by James William Hawes, 1914. The Howland books published by the Mayflower Society’s Five Generation Project would also have the descendants of John Hawes and Desire Gorham. Generation 1: Edmond Hawes, son of Edmond Hawes, baptized 15 October 1613 in Solihull, Warwickshire, England; died 9 June 1693 in Yarmouth, Massachusetts; married with one known, surviving child. Generation 2: John Hawes, born about 1636 in Duxbury, Massachusetts, died 11 November 1701 in Yarmouth; married on 7 October 1661 in Barnstable, Massachusetts to Desire Gorham, daughter of John Gorham and Desire Howland. She was born 2 April 1644 in Plymouth, Massachusetts, and died 30 June 1700 in Yarmouth. Eleven children. Generation 3: Elizabeth Hawes, born 5 October 1662 in Yarmouth, died between 25 December 1732 and 13 February 1734 in Edgartown on the island of Martha’s Vineyard; married on 22 January 1684 in Bristol, Rhode Island to Thomas Daggett, son of Thomas Daggett and Hannah Mayhew. He was born about 1658 and died 28 August 1726 in Edgartown. Ten children. The story of Nancy Luce is sad and depressing. She was considered an oddity during her lifetime, and now in death gawkers gather at her strange gravesite. On the island of Martha’s Vineyard, where she spent her life, she is known as “The Chicken Lady”. Nancy Luce was born in 1814, to a family of means, the daughter of Phillip Luce and Anna Manter. She came down with some sort of illness as a young woman, and the disabilities lasted the rest of her life. Some think she may have been an early sufferer of Lyme disease. Her parents died at about this time, and neighbors tried to steal her property. She won her rights but it left a bitter taste with the islanders, who hated her. She lived alone, lonely and in poverty for the rest of her days. For companionship she had her chickens. She spent all her money on their care, and her egg money on their elaborate burials. Each chicken had a casket and granite tombstone. They had odd names like Toona, Otte Opheto and Tweedle Dedel Bebbe Pinky. People thought she was crazy. She wrote little books about her chickens to help pay for the taxes and expenses. Curiousity seekers and tourists took her photographs and made postcards of her, but she didn’t receive any income from the photos. She died alone in her house on 9 April 1890. No one discovered her body for several days. 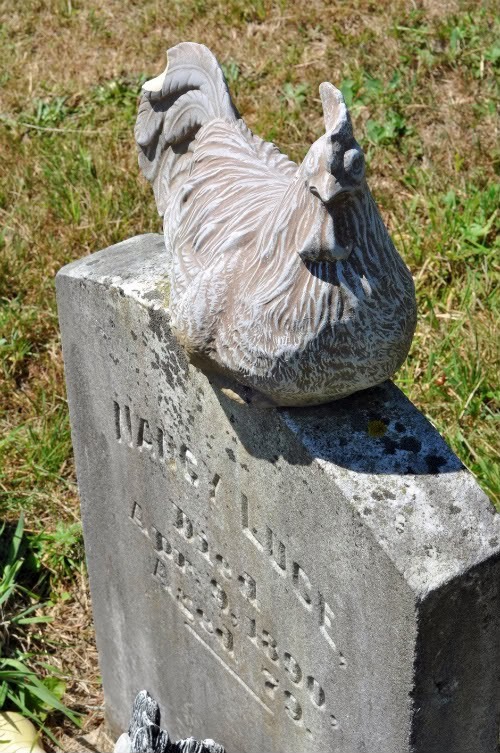 Her farm was sold and the tombstones for her chickens became doorsteps. 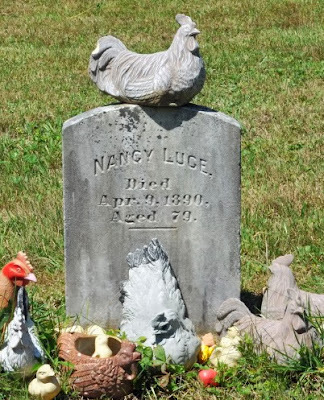 She had a decent burial, and even today her fans decorate her grave with chicken dolls, statues and glass eggs. No more to be my firend. Nancy Luce’s papers are now at the Brown University Library. Walter Magnes Teller used them to write his biography of Luce. They can be accessed at the Hay Annex, call numbers Ms. LUCE Box 1 and Box 2. Generation 1: Henry Luce, born 1644 and died May 1687/88 in Tisbury; married about 1666 to Remember Litchfield, daughter of Lawrence Litchfield and Judith Dennis. Generation 4: Thomas Luce, born 1743 in Holmes Hole, Tisbury, Massachusetts and died about 1810 in Tisbury; married on 29 June 1769 in Holmes Hole, Tisbury to Hulda Butler, daughter of Shubael Butler and Hepsibah Daggett. She was born about 1747 in Edgartown. Shubael Butler is the son of Zephaniah Butler, my 8th great grand uncle. I descend from Zephaniah's brother, John (see above). Generation 5: Phillip Luce, born 11 December 1771 and died 1 May 1847; married on 14 March 1811 in West Tisbury to Ann Manter, daughter of George Manter and Sarah Athearn. She was born 28 July 1778 in Tisbury, and died 14 June 1851 in Holmes Hole, Tisbury. Generation 6: Nancy Luce, born 23 August 1814 in Tiah's Cove, West Tisbury and died 9 April 1890 in West Tisbury. 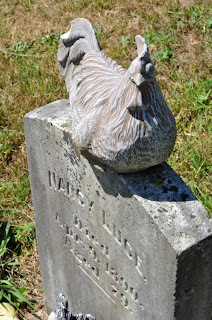 Heather Wilkinson Rojo, "Nancy Luce the Chicken Lady of Martha's Vineyard", Nutfield Genealogy, posted January 17, 2014, ( http://nutfieldgenealogy.blogspot.com/2014/01/nancy-luce-chicken-lady-of-marthas.html: accessed [access date]).